Posted June 8th, 2015 by Berkley Human Services & filed under Risk Control. Many Berkley Human Services (BHS) Customers are often perplexed when Loss Control makes recommendations for implementing a Hot Work Program. “We don’t do any welding or use torches” is often the response. Why wouldn’t they object? Our customers are Human Services Organizations. They don’t use tools or equipment that generate heat, sparks, or flames. However, every Human Services Organization has the need to either perform maintenance & repair on their buildings and auto’s, or hire a contractor to perform these tasks. Our consultants often find welding equipment, torches, grinders, and heat guns in facility maintenance shops or garage. Maintenance staff have many short-cuts that often involve the use of a torch, grinder, or heat gun. Using a torch to help loosen a nut on lawn care equipment or vehicle, or using a heat gun for scraping paint. Management should be mindful of the work to be done by independent contractors that may involve Hot Work. Your Hot Work program should be enforced with written permit requiring your Permit Authorized Individual’s (PIA) signatures. NFPA defines Hot Work as: Work involving burning, welding, or a similar operation that is capable of initiating fires or explosions. Management of hot work includes all persons, including owners, contractors, educators, and so on, who are responsible for hot work operations. Is there an area where Hot Work can be performed without the need to require Hot Work Procedures and Permit? Yes, the approved area would typically be an adequately vented maintenance shop made of non-combustible construction with all combustible materials and flammable liquids permanently removed. The decision tree on the right (copied from NFPA 51B) should be used to determine the need to enforce your hot work program procedures. In many cases, the need to require the program and procedure will be easy to identify. All staff involved with managing the process can reference this information for every situation. The PIA can be prepared to walk management through their evaluation process using the decision tree analysis. 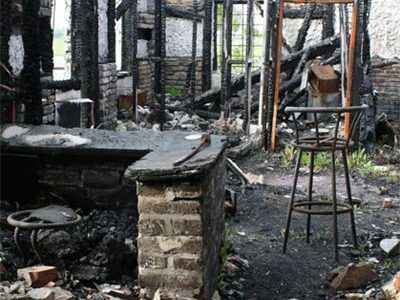 NFPA 51B sites a collection of accounts of fires caused by improper control of hot work. From Warehouses to Food Processing operations, Hospitals to Apartment Buildings. Hot Work is a necessary part of our world. A contractor installing new elevator equipment in a seven story office building with plank floors set a number of fires as the result of cutting and welding. The contractor’s employees extinguished all but one. That fire occurred toward the end of the day’s work, and the four employees, without discovering the fire, went home. Later in the evening, the elevator penthouse (partly made of wood) was ablaze. Two hours later, the fire department brought the fire under control. The loss, mainly to the top story from fire and the lower stories from water, was $530,000. Workers were using an acetylene torch to remove old heating ducts in a utility shaft between floors. Flying sparks fell through a vent and ignited papers stacked against the vent in a storage room. The fire burned for 30 minutes before being noticed. Hot Work hazards are commonly overlooked and too often, persons involved with these processes do not fully appreciate that improper care can result in loss of life and property from fire. In fact, Hot Work performed improperly is a major cause of fire. Suggestions and comments contained herein are provided for purposes of general education only. Suggestions and comments are not intended for the purpose of providing you with legal advice or legal counsel, and are not intended to assure compliance with or complete analysis of any law, rule or regulation. In addition, suggestions and comments should not be interpreted to imply or infer that all exposures, hazards or loss potentials on any subject or issue were identified or considered. No warranty, or guaranty of accuracy, fitness or suitability, express or implied, is granted with respect to any of the information contained herein.